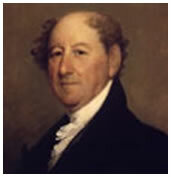 Rufus King was an American lawyer who was also a renowned politician and diplomat. King was assigned to Continental Congress and the Constitutional Convention with the distinction of being the only delegate coming from Massachusetts. He occupied the following posts during his lifetime: New York representative in the U.S. Senate, Minister to Great Britain and the candidate for Vice Presidency from the Federal party-list between the years 1804 to 1808 respectively. He was also a Federalist candidate for President of the U.S.A on the year 1816. Born at Scarborough, formerly a part of Massachusetts, now located at Maine, he was the offspring of two well-off famer-turned-businesspeople. His parents, Sabilla Blagden and Richard King, inhabited Dustan Landing and made a lot of money and acquired a lot of properties in the year of King's birth. The success and financial abundance of his father brought envy and resentment to their neighbors so that when the Stamp Act 1765 was approved, their house was broken into and every piece of furniture they had was vandalized. No one was penalized for the crime and a year after that unfortunate incident, their barn was burned to the ground. King went to The Governor's Academy and Harvard College and completed his post- secondary education in 1777. While he was under the apprenticeship of Theophilus Parsons, the Revolutionary War in America broke out and he volunteered for militia duty. During the Battle of Rhode Island, he became a major and assistant to Gen. Sullivan. After the war, he resumed his studies under Parsons and became a lawyer by 1780 and started to practice his profession at Newburyport in Massachusetts. He became the youngest delegate of the Confederation Congress from years 1784-1787. He was assigned to attend the Federal Constitutional Convention on 1787 at Philadelphia where he was able to acquaint himself with Alexander Hamilton and worked with him on the Committee of Style and Arrangement. He went home and made the Constitution be ratified with another major goal of being elected as Senator. The Constitution was ratified but he lost the elections. Hamilton convinced him to transfer to NYC and was elected to the NY State Legislature during 1788. King became the official candidate of New York to serve in the U.S. Senate. His candidacy upset the Livingstons who are planning by that time to endorse Robert Livingston. Gov. George Clinton supported the candidacy of King and by the terms 1789-1796 and 1813-1825, he was seated as a senator representing NYC. The author of Navigation Act of 1818 was him. From the years 1796-1803 and 1825-1826, King became a diplomat serving the Court of St. James. Even if it was known that he was a Federalist, Thomas Jefferson did not fire him until King himself asked for substitution. He settled rifts concerning the Jay Treaty. During his time, America and Britain were on good terms. When he was at Britain, he became well-associated to Francisco de Miranda, a South American rebel. He helped him in his trip to U.S. to gather support for his unsuccessful voyage to Venezuela. King lost the vice presidency in 1804 and 1808 and presidency on 1816 under the Federal Party-list.